Bronwyn started playing cricket in the 1980/81 season at the age of 11 for the then called Northern Suburbs District Cricket Club (now known as North Canberra Gungahlin Cricket Club). Bronwyn was an outstanding, accurate and skilful medium pace bowler and attacking middle order batter who represented Australia, ACT and NSW. Bronwyn represented the ACT from 1983 - 1995 at national level (1518 runs @ 28.11, 100 wickets @ 19.39) and was selected to represent Australia in 1991, matching the achievement of her friend (and later coach) Jodie Davis who played for Australia in 1988. 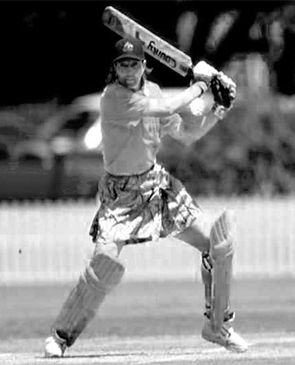 From 1991 - 1998, Bronwyn played three Tests against England (women’s Test matches are rare) and 34 One Day Internationals which included two World Cups (1993 and 1997). In ODIs, Bronwyn was not only a wicket taker (29 @ 22.41, best bowling 4/4) at just 2.3 runs/over. Her batting with an average of 53.4 at a strike rate of 75.2 showed she could score runs (534, HS 81 no) while placing a high price on her wicket. In 1995 ACT withdrew from senior national competition and with the formation of the Women’s National Cricket League (WNCL) in 1996, Bronwyn was selected to play for NSW which enabled her to continue her career at the highest level. Bronwyn’s achievements for NSW (1996-2004) were 509 runs @ 18.85 (2 x 50s, HS 61 no) taking 95 wickets @ 22.96 (best bowling 3/18). Over eight seasons, she played 80 matches and won seven WNCL titles. Bronwyn was enticed out of retirement in 2006 to help the fledgling ACT team prepare for its entry into the WNCL in 2009-10. She added great experience to the team in the CA Cup and in her last match, against South Australia, returned figures of 10 overs, 9 maidens, 7 wickets for 2 runs with the two runs being wides! Bronwyn is still involved in the game as both the women’s statistician for Cricket Australia and the on-line scorer at Manuka Oval.